Helena joined as the VIC Branch Manager in 2018.Helena is passionate about developing awareness and understanding of Alopecia and supporting people with the condition, particularly parents and children. She understands the emotional impact of Alopecia as she has had Alopecia Areata throughout her life and her son developed Alopecia Universalis in 2017 at age six. Helena is a mum of two beautiful boys and is currently studying a Bachelor of Education (Primary). AAAF runs a wide range of events, from Open Days and Trivia Nights, to pizza dinners and casual catch ups over coffee. 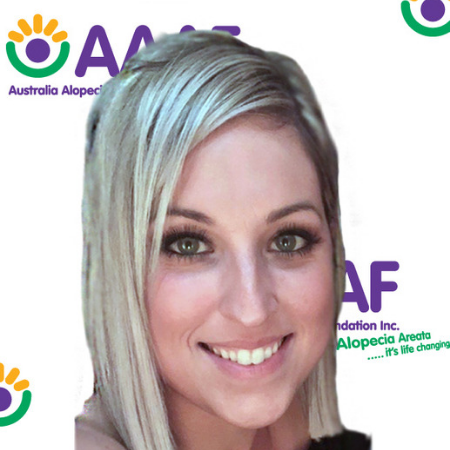 These events all aim to provide a supportive atmosphere and chance to socialize with other people who have Alopecia Areata and their families. See the calendar below for our upcoming events. CRLab Australia 03 9681 7653/ 0447 341 775 Website Introducing the CNC hair replacement system – a custom-made scalp and hair prosthetic that looks, feels and moves like real hair. LC Wigs 0490179795 Website We provide you with the most natural looking human hair wig at a wholesale price ; so you can feel like you again without breaking the bank! Wunderwigs Australia 0419 885 115 Website European human hair ponytail wig, specialising in comfort, quality and glamour. Known for its minimal maintenance, versatility and beauty. Popular for all ages. R&Z Wigs Australia Pty LTd Sofy 0413023180 or Sarah 0433055576 Website Quality wigs at affordable prices. We specialize in fashion and medical wigs all made of 100% virgin human hair. We offer 3 different ranges :Brazilian, European and Russian hair wigs. Clive Hair Clinics Ltd (03) 9654 0022 Website Scalp treatment therapy replaces missing Amino Acids using non-drug treatments. info@tammylobatowigs.com.au Website Tammy uses her experience & empathy from having Alopecia for over 40 years to provide others with high quality service and realistic synthetic and human hair wigs. hello@eyeart.com.au Website Professional Cosmetic Tattoo services including Eye Brow Tattoo (Microblading, Featherstroke, 3D, Powder, Ombre’ and Combination Brows), as well as Eye Liner Tattoo. Free services available for clients with alopecia. Saving Face Permanent Make Up – Sam 0419312065 Website Permanent Make up for Eyebrow and Eyelash area. 10% discount to all AAAF clients. Headsox 03 52619964 Website Stay warm or stay cool.